The term "fork-tender" was invented for slow-roasted pork shoulder. Sure it takes half a day, but the building anticipation makes that first bite into the sticky, succulent pulled pork meat even better. Rinse the meat, and pat dry with paper towels. Trim off any large pieces of excess fat. Place the pork, fattier side up, in a large Dutch oven. Pour 1/3 cup water into a small, ovenproof ramekin, and add the liquid smoke. Place this ramekin in the Dutch oven next to the meat. As the pork roasts, this will introduce moisture to the cooking environment, as well as add a subtle smokiness to the meat. Cover tightly with the lid, and place in the center of the preheated oven. Roast pork for 12 hours, or until fork tender. If you're using a thermometer, the internal temperature will be around 200 degrees F. Turn off the oven and allow the pork to rest for 1 hour before removing. Place the pork on a cutting board and use forks to pull it apart into small pieces. Taste for salt and spice level, and adjust the seasoning. 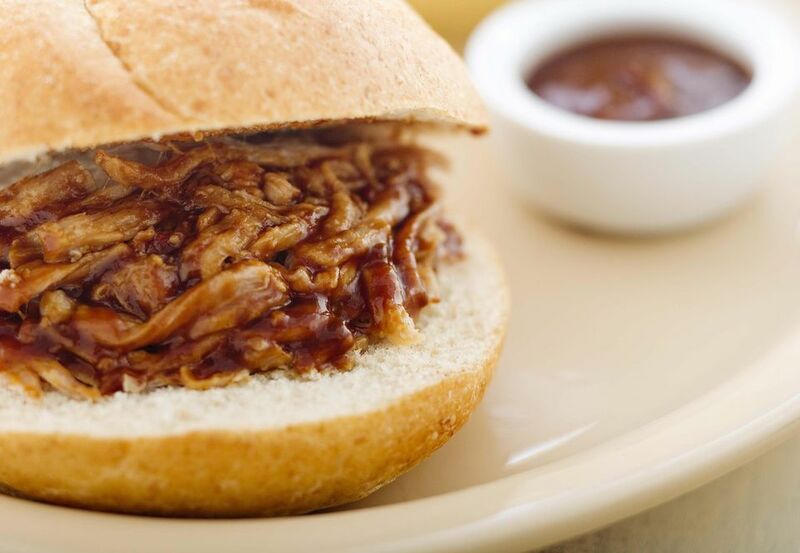 Serve warm or room temperature on soft rolls, splashed with some of your favorite barbecue sauce.